Closely on the heals of their victory in an asset forfeiture case in New York, the Institute of Justice (IJ) successfully fought the state licensing requirement for hair braiders in Texas. A 2013 press statement on the Institute for Justiceâs website described Brantleyâs frustration with the criteria: âThis means that Isis must spend 2,250 hours in barber school, pass four exams, and spend thousands of dollars on tuition and a fully-equipped barber college she doesnât need, all to teach a 35-hour hair-braiding curriculum,â the statement read. U.S. District Judge Sam Sparks on Monday seemed to agree with Brantleyâs concerns that the requirements for hair-braiding entrepreneurs were superfluous. Sparks ruled that the Texas laws were unconstitutional and âabsentâ a rational connection with Brantleyâs intended marketplace, the Associated Press reports. Good. Unfortunately, there does not seem to be a way to fight these stupid licensing laws except one at a time, state by state. And every time we take one on, the incumbent competitors in that business (who are the primary beneficiaries of licensure that restricts new competition) fight tooth and nail every step of the way. I will observe that red states are just as bad as blue states on occupational licenses. This is cronyism, not ideology. From this site, here are just a few the occupational licenses one still needs in Texas (this is from a school web site, so these are just the ones that have continuing education requirements that this school serves). I suspect that this list is incomplete, as long as it is, because barbers and hair stylists, the subject of this case, are not even on the list. If not otherwise licensed, 60 hours. All hours specific to or related to chemical dependency. Counselor, Professional Counselor, Professional 12 hours/year inc. 3 hours ethics or legal issues every other yr.
Interpreter Interpreter for the Deaf 75 hrs/5 yrs. Marriage & Family Therapist Marriage & Family Therapist 15 hrs/yr; 3 hrs ethics every 3 yrs. Occupational Therapists Occupational Therapist 30 hrs/2 yrs. Optometrists Optometrist sixteen hours of continuing education/ year inc.
Veterinarians and Veterinary Inspectors Veterinarian 15 hrs/yr; 3 hrs ethics every 3 yrs. A Third of Welfare Recipients in California? I had trouble believing this chart (ht Maggies Farm) until I looked at the HHS data here and saw it was dead on. 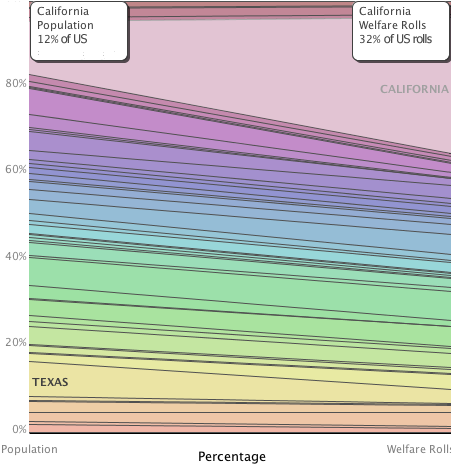 On the chart below, the width of the band at the left is percentage of the US population, and to the right is percentage of the US welfare roles. The second biggest band, in green, I believe is New York. Its incredible that California's financial problems can be in the news for months and I have never seen a whiff of this in the media.